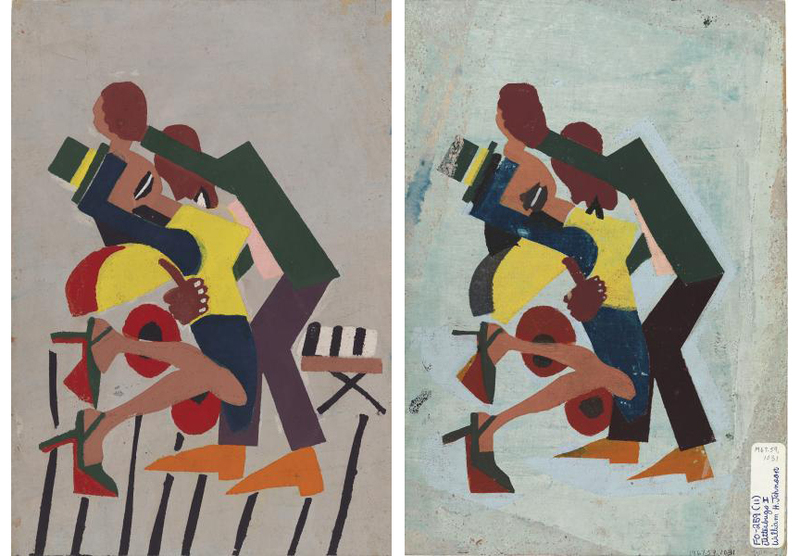 Two extremely scarce prints from William H. Johnson’s Jitterbugs series will make their auction debut with African-American Fine Art on April 5. The series was conceived and executed during Johnson’s tenure in New York in the early 1940s, during the Harlem Renaissance. The series of five images constitutes a significant portion of the 17 known screenprints Johnson made. He worked in the medium for only three years until tragedy struck in 1943: his Danish wife, Holcha Krake, was diagnosed with breast cancer and died just a few months later. It’s impossible to know for sure if these events are related, but the timing is certainly suggestive. 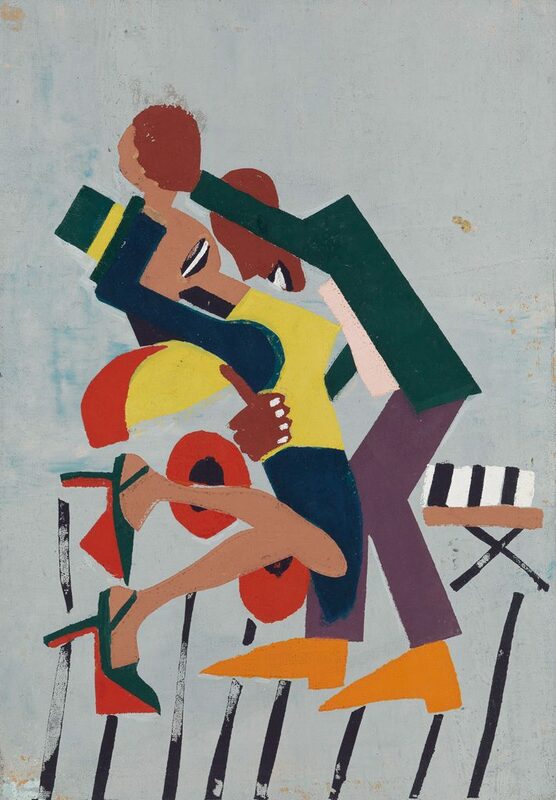 Lot 24: William H. Johnson, Jitterbugs II, color screenprint, circa 1941. 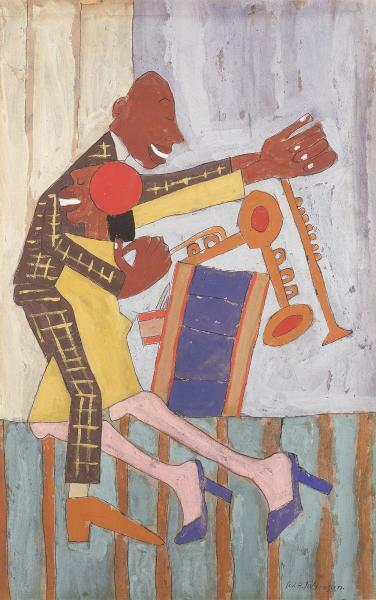 William H. Johnson, Jitterbugs II, gouache and pen, circa 1941. Courtesy of the Smithsonian American Art Museum. 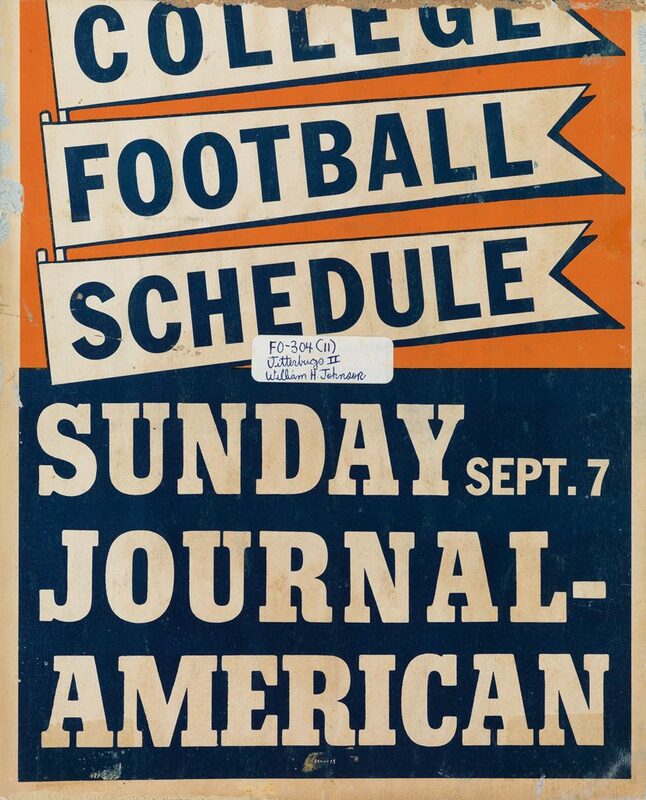 There is a printed advertisement for a football game on the verso; the proof in the collection of the Museum of Modern Art has the same. We know of ten other impressions of Jitterbugs II in public collections: three in the Smithsonian American Art Museum, and other impressions in the Art Institute of Chicago, the Amon Carter Museum, the Cleveland Museum of Art, the Library of Congress, the Metropolitan Museum of Art, the Museum of Modern Art and the Philadelphia Museum of Art. These are experimental and painterly prints, using both screens and pochoir (hand-colored stencils). Each impression is are reminiscent of proofs, and has a slightly different registration. Also offered is Jitterbugs III. 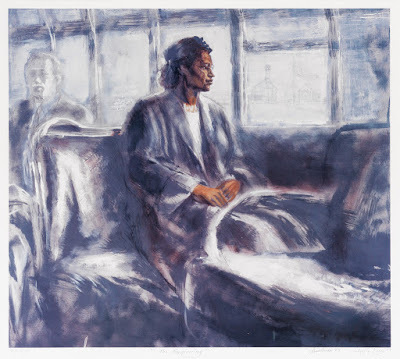 Like its counterpart, this print has never before appeared at auction. On the verso is a another printing of the same image, emphasizing the proof-like nature of the series. 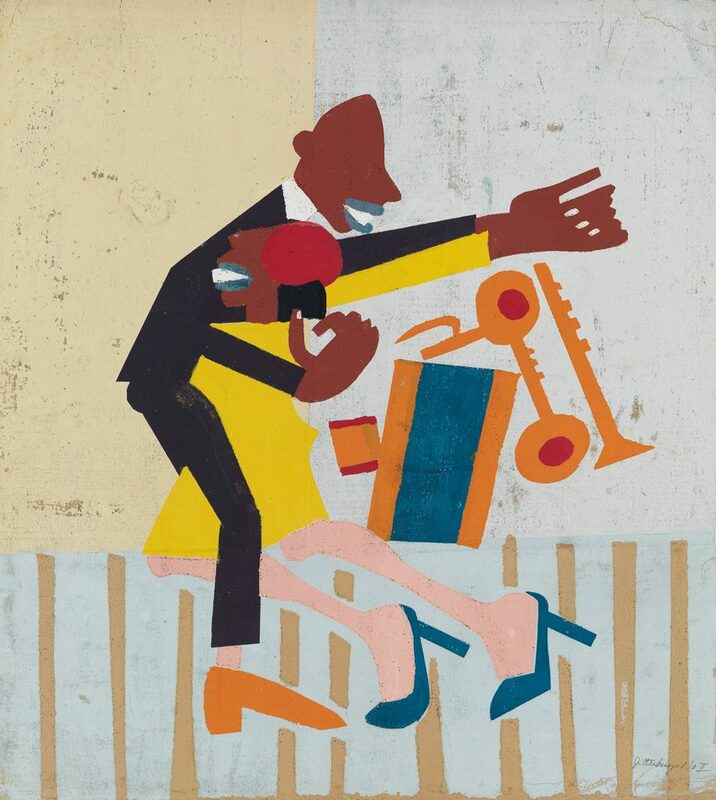 Lot 25: William H. Johnson, Jitterbugs III (recto), color screenprint, circa 1941. Estimate $30,000 to $40,000. We have located only four other impressions of Jitterbugs III in public collections: one each at the Library of Congress (identified as Jitterbugs I) and the Amistad Research Center (identified as Jitterbugs II), and two at the Smithsonian American Art Museum. One of the Smithsonian’s examples, like the one offered here, bears the image on both sides of cardstock. 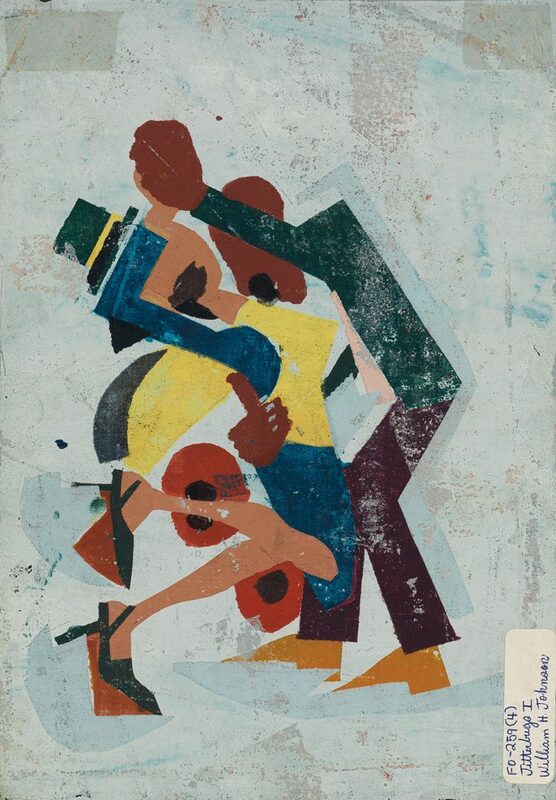 William H. Johnson, Jitterbugs III, recto and verso, screenprint, 1941. Courtesy of the Smithsonian American Art Museum.